Known for lush still lifes, landscapes, and portraits in oil, he also works in watercolors and pastels. He began to get attention as an artist in the early 1980s as an artist who obviously loved the Southwest. In 1988, he won the Robert Lougheed Memorial at the National Academy of Western Art Exhibition, and he has also received recognition from the Pastel Society of America and the Northwest Rendezvous, both of which he is a member. He was born and raised in the Middle East and enrolled in art classes at age fifteen and was trained in the style of the Russian masters and traditions of Ilya Repin and Valentin Serov. Soon after, he had portrait commissions. His parents died when he was young and did not live to see his success. When he was in his early thirties, he became a United States citizen and moved first to Nevada where other family members had settled. In 1970, he did a large mural for the MGM Grand Hotel in Las Vegas. He worked as an interior designer, but wanted more freedom to be creative. Eventually he moved to Arizona and established his studio and home in Tempe. He prefers to work from afternoon into the night because he likes quiet and solitude. In America, he has done portraits of celebrities including Frank Sinatra, Sylvester Stallone, and Dean Martin. 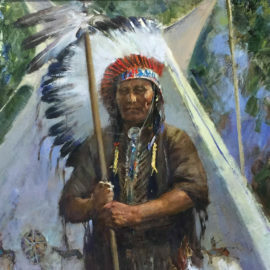 He has exhibited at numerous western shows including The Gilcrease Museum in Tulsa, Oklahoma and The Cowboy Hall of Fame in Oklahoma City.